Eyelid surgery, or blepharoplasty, is a surgical procedure to improve the appearance or functional problems of the eyelids. Surgery can be performed on either the upper or lower lids, or both. The latest trend of beautiful eyes in Korea is believed that the size and proportion must be considered in order to achieve beautiful eyes. The delicate skills of Korean surgeons and immaculate design techniques naturally allows for the eyes to look much bigger and clearer. Experience perfection at the plastic surgery clinics in Korea where they can customize double eyelids to bigger and more beautiful eyes. (Left) The most ideal eye shape is Perfect symmetry and the distance between the eyes and the length of eye should be about 30-40 mm wide. (Middle) The inner corner of the eyes should vertically be connected to the alar of the nose, and the outer corners of the eyes should diagonally correspond to the alar on the same side. (Right) From the frontal base of the eyes, the outer corners should be slightly superior or elevated from the horizontal line. In order to create beautiful eyes with perfect ratio, multiple eye procedures may be needed to be done at the same time. General price guide line for Eyelid surgery is USD$1,100 to USD$2,800 according to Korea Health Industry Development Institute. The price is decided depending on the method and difficulty of patients’ case. To read more about Korean Plastic/Cosmetic surgery price in Korea, check Know your plastic surgery price. It is also very important to find the most suitable double eyelid shape and crease for vivid, bigger and natural eyes. 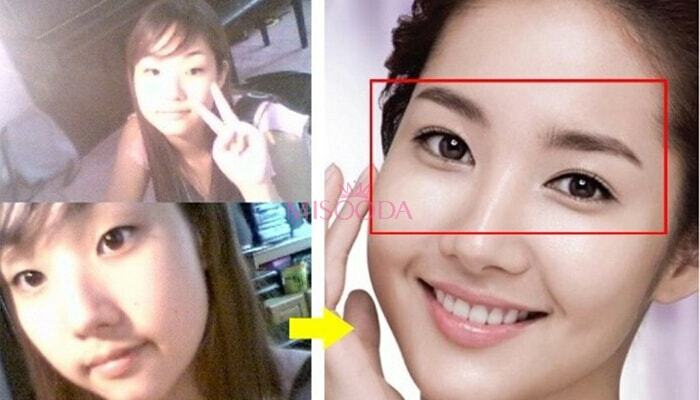 Korean double eyelid experts’ advice never to mimic someone else’s crease and shape because it may not suit you best. It is one way of surgery failure. Here are shapes of different eyelids to consider before taking a double eyelid surgery. Double eyelid of Westerners are 100% Out Type. The line is not hidden. The starting point is not joined from the outside and continues to the end in a parallel line as if a rainbow, hence it is also called parallel type. Since the line should be usually soft and natural looking, an outer line created by the incision method is sometimes seen as having a bad surgery. What a Korean double eyelid expert would recommend is a natural looking outer line, therefore, it is better to make the outer line using the embedding method (suture method) rather than the incision method. In case of thick eyelid skin or small eyes, extra care should be taken. The line is seen as a combination of the inner and outer line. As the front part of the line begins from the outside to the ending it seems like out line. But the difference is the beginning part of the line starts very narrow and as it leads to the end part, the thickness of line gets wider, this type of double eyelid looks as if the inner type. This is the most ideal type of double eyelid but only possible for eyes that are long with thin eyelids. Depending on individual case, some patients may show traces of surgery, therefore the doctor needs to make decisions carefully.